Take me to the comics! This is the online shop for Peppertop Designs, home of the Monsters, Inked and The Greys webcomics. Here you can order books and CDs from us, and find more information about our t-shirts, which are sold via a third party supplier. If you don't want to buy anything, but do want to support our work, we're not too proud to accept donations! We try to keep things simple: anything ordered from us incurs a flat-rate £2 shipping charge, no matter how much you order or where in the world you're located. T-shirt orders are fulfilled by a third party who will impose their own shipping charges. We use Paypal to process our orders, but you do not have to have a Paypal account in order to make a purchase: any major debit or credit card will do. If you have any questions or problems, please email us at [email protected]. Published by Dead Universe Publishing. This 28-page full colour book (210mm x 145mm) features all the comics that appeared in The Bucks Herald, plus others that we subsequently posted online. 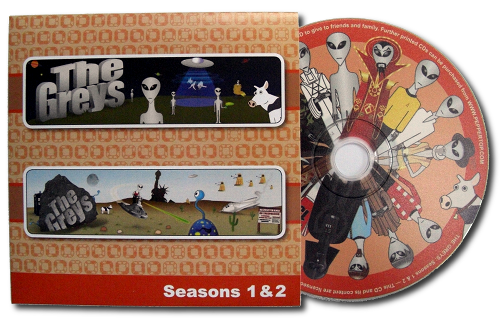 With additional trivia and behind the scenes insights, it's a must for any fan of the series. 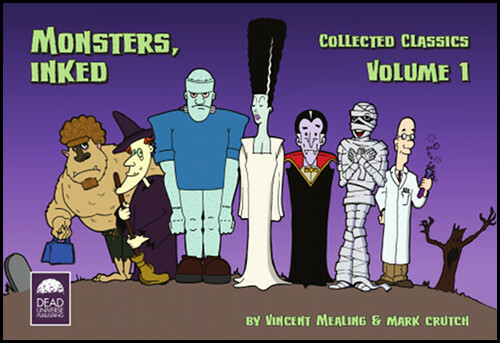 Monsters, Inked started out as a newspaper strip, so this family friendly book is suitable for anyone from 7 to 70.
and a whole load of extras. Even we don't know what you'll get until we send it. Just add this to your order and we'll include some sort of Peppertop extra in your shipment. In the past we've sent stickers, greetings cards, flyers and even original sketches or an extra CD. It really does depend on what we've got kicking around at the time, so why not take a gamble!? We don't (yet) make our own T-shirts, but we do have a few designs available at Redbubble.com. Click on the image below top open our Redbubble store in a new tab or window. It costs us hundreds of pounds every year to host our website, and the bandwidth requirements increase almost every month. Even if you don't want to buy anything, you can help us out with a small donation. Thank you. We want to continue offering our comics for free download. We want you to be able to share them with your friends. We even make the source files for The Greys available so you can take them apart, learn from them, or even modify them yourself, for non-commercial use. But every link that's shared, or file that's downloaded, eats up a little more of our bandwidth. Visitors numbers to our site have grown to over 15,000 per month! That's great... but it also means our bandwidth costs have quadrupled since we started. In 2012 the total income from the site was less than 10% of the bandwidth costs, with all the rest being paid out of our own pockets. We would love to reach a point where the site can pay for itself one day, but we're a long way from that yet. In the meantime your donations really do help.